When your turn begins, you may pay 1credit to place 1 virus counter on Darwin. 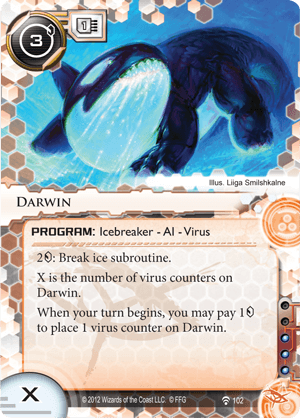 Darwin is a cute little program that does very well in a few niche Anarch decks that rely on a heavy virus suite. To make Darwin effective, you have to combine him with Virus Breeding Ground and run 3 Cyberfeeders. His evolution then jumps in speed from crocodile to Pokemon. Take one free credit from Cyberfeeder, click to transfer another virus counters or two and he's suddenly a Strenght 2 or 3, threatening most Ice on the board. Darwin gets a lot of benefit from e3 Feedback Implants, as well as Hivemind and obviously Grimoire. Run him in a virus deck with Noise: Hacker Extraordinaire or Quetzal: Free Spirit and you'll be amazed at how versatile and useful he can be when given the proper support to evolve. You might want to run a few Festers, though, as the Corp will purge you quite often.